1. Wash the pears, onions, peppers and celery in cold water. Peel and core the pears. Remove stems and seeds from the peppers. Clean the celery; peel the onions. 2. Put pears and vegetables through a food chopper. 3. Stir the sugar, allspice, salt and vinegar into the chopped mixture and let stand, covered, overnight in the refrigerator. 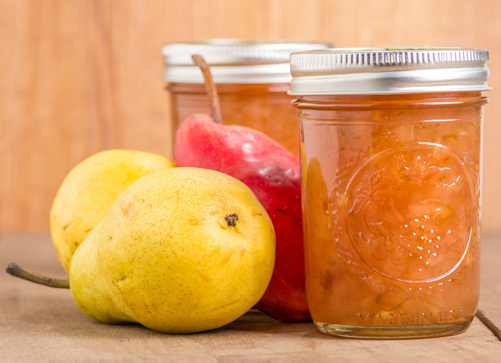 4.Wash and rinse canning jars; keep hot until ready to use. Prepare lids according to manufacturer’s directions. 5. Heat the relish mixture to boiling; simmer 5 minutes. 6. Pack hot relish into hot pint jars, leaving ½ inch headspace. 7. Remove air bubbles and adjust headspace if needed. Wipe rims of jars with a dampened clean paper towel; adjust two-piece metal canning lids. 8. Process jars immediately in a Boiling Water Canner according to the recommendations. Let cool, undisturbed, 12-24 hours and check for seals.